Carrier, part of UTC Building & Industrial Systems, offers a complete range of products for marine refrigeration and air conditioning applications, serving the commercial shipping, cruise and offshore industries. 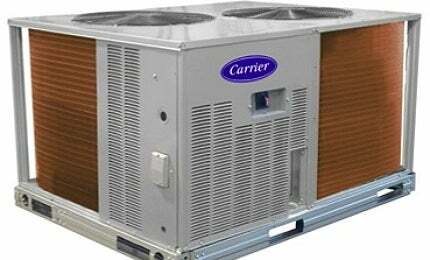 Carrier’s roots date back more than 110 years, to Willis Carrier’s invention of modern air conditioning. Building on his legacy, the company brought the innovation to the cruise industry in 1931, when it equipped the M.V. Victoria with air conditioning, making it the first cruise ship to use the technology to enhance passenger comfort. Today, Carrier remains a global leader in maritime air conditioning and refrigeration technology, with products found aboard cruise ships, commercial vessels and offshore rigs throughout the world’s oceans. With an understanding of the space limitations, harsh climates and demanding work conditions found on offshore platforms, Carrier designs custom comfort cooling, process cooling and refrigeration solutions specifically for offshore applications. Featured products for the offshore industry include Aqua Series air-cooled and water-cooled chillers, Gemini™ high-efficiency condensing units and AERO® 39M air handlers. Each product is packaged with features that provide high performance, energy efficiency and on-demand control. Carrier Marine & Offshore Systems’ products are built tough, to perform safely and efficiently in the most demanding situations. Many of their products can be customised for hazardous locations, using NFPA 70 (NEC), or ATEX construction methods. The company also designs to meet specialised needs, including special coatings, copper coil construction and SS316L cabinet construction. With Carrier Marine & Offshore Systems, customers do not have to rely on a third party to modify land-based equipment for offshore. As part of Carrier, they have access to OEM-level technical data, resources, processes and specialised knowledge to engineer and oversee any offshore specific modifications. These unique capabilities allow Carrier Marine & Offshore Systems to offer reliable solutions, customised to the application, with the backing of the manufacturer. Carrier recognises the importance of eliminating downtime on today’s offshore rigs. With global parts and service centres, Carrier provides the parts and related service support customers need, no matter where they are in the world. With more than 600 dealers, distributors and parts depots worldwide, customers are likely to find a Carrier engineering professional in their key ports. Carrier experts provide personal service to assist customers in obtaining and installing the part they need. If they don’t have it in stock, Carrier’s parts and service network will locate and ship replacement parts on the same day they’re needed. A proven legacy, paired with new technology expertise, makes Carrier Marine & Offshore Systems a total solutions provider for optimising efficiency and performance on offshore rigs. Their commitment to the offshore marketplace is backed by unmatched knowledge and service capabilities exhibited by a global team of dedicated professionals. As a global leader, Carrier never stops working to bring safe, sustainable and reliable products to all corners of the world. Turn to Carrier Marine & Offshore Systems, and turn to the experts.